Swiss watchmaker RJ-Romain Jerome is known for producing insanely extravagant watches out of material like “moon dust” and the metal used on the Apollo 11 spacecraft. Their latest production is a tie-in with Taito, a Space Invaders-branded watch that’s available in two styles, but basically are inspired by the design of lunar landers. If you want one, act fast — RJ is only making 78 of each. But consider if that game really made a mark on your life, because you’re going to have spend upwards of $15,000 to get the watch based on it. 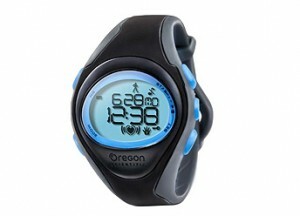 Check out this sports watch that has a heart rate monitor in it. You tap to turn it on and off. SE102 is an entry-level heart rate watch with basic heart rate measurement and calories burned features. With a simple tap on the lens of this product, you can change the readouts to display relevant information. The included chest belt transmitter is worn comfortably against the skin. The chest belt picks up the heart signals, and sends them wirelessly to the watch. The watch unit receives and shows heart rate signal. The upper and lower heart rate zone alarm can be programmed as a visual or vibrating alert. Smartphones with Android, or any other smartphone-integration isn’t anything new. Sony Ericsson did their best with the Live View but it pretty much failed, although the concept was wonderful. This time around, i’mWatch by Blue Sky Srl is taking another stab at the concept. The Italy-based designer has put together a pretty impressive ‘smartwatch’ which will be able to integrate via Bluetooth with your iPhone 4, Android device or future models of RIM’s Blackberry line. The model above is just one of seven colors that are available. The i’mWatch allows you to view the time, make calls, receive calls, use the speakerphone for voice calls, receive text messages, receive emails, check the weather and much, much more. Unfortunately, the i’mWatch is priced at €249 which translates to $360 – quite a hefty price tag for a watch; even one that is as full-featured as the i’mWatch. Check out the official website for more information, video and ordering info. The watches in OMEGA’s Seamaster Planet Ocean collection have been held in equally high regard for their professional divers’ features, their style and their innovative Co-Axial technology since they were introduced in 2005. OMEGA has upgraded the entire family and each of the new Planet Oceans is equipped with one of the brand’s revolutionary family of in-house Co-Axial calibres – the 8500/8501, the 8520/8521 or the new 9300 chronograph. The movements also have the Si 14 silicon balance spring and the combination is so stable and reliable that OMEGA offers all of the new Planet Ocean watches with a full four-year warranty. Philip Stein Group, parent company to the FRUITZ watch brand debuts a limited-edition collection of timepieces infused with their proprietary Natural Frequency Technology for PeaceLove Studios. PeaceLove Studios is a growing community of mental health advocates and artists dedicated to breaking the “silence” surrounding mental illness with a positive symbol that is focused on creating hope and acceptance for this social injustice. Through the sale of PeaceLove Studios Art dial watches, FRUITZ by Philip Stein will donate 10% of gross profits to support PeaceLove Studios, providing individuals and families coping with mental illness access to resources, opportunities and healthcare. Each watch purchased provides approximately five children living with mental illness the opportunity to participate in the PeaceLove Studios Paint4Peace program. Paint4Peace teaches art as a means to inspire, motivate, build self-confidence and deliver a message of hope. Collectively FRUITZ by Philip Stein and PeaceLove Studios, strive to provide individuals and families with the promise of inclusions, integration, productivity, independence and an improved quality of life. The art was first created by founder of PeaceLove Studios and artist, Jeff M Sparr who has battled Obsessive Compulsive Disorder (OCD) for years. While Jeff paints in order to focus and gain control, he also wears a Philip Stein Timepiece to help him regulate his stress and balance his energy. Jeff found immediate benefits from the brand’s exclusive Natural Frequency Technology embedded in every watch, which clinical studies suggest work with the body to reduce stress, aid in enhanced sleep and increase focus, giving the wearer and overall improved sense of well being. Jeff partnered with Philip Stein in order to create a limited-edition art dial watch collection designed by the PeaceLove community artists as creative expressions of the struggles we endure to find peace of mind and love in our hearts. The collection of watches will feature colorful one-of-a-kind PeaceLove artwork and Philip Stein’s exclusive Natural Frequency Technology. 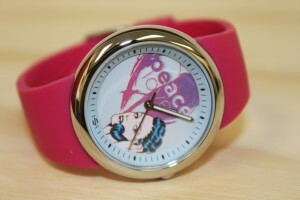 (not limited edition) watches of each design will be sold online for $225 at PeaceLoveStudios.com or FruitzWatches.com or FRUITZ retailers nationwide As with all Philip Stein timepieces, the limited-edition FRUITZ for PeaceLove Studios watches contains Natural Frequency Technology. The PeaceLove Foundation will be hosting their first annual fundraising event, celebrating supporters who have helped to make the organization possible. The event will be held on Tuesday, May 17th, 2011 from 7-10pm at 1005 Main Street, Pawtucket Rhode Island. FRUITZ watches sport an oversized dial with a multicolor sunburst design in either stainless steel or gold plated cases. The unique design of the timepieces feature “seeds” instead of numbers for markers, a distinctively curved second hand accentuated in a contrasting color from the dial and a sleek silicon strap in coordinating hues. The various collections retail from $225 -$295. Philip Stein is the leader in watches and other lifestyle products using proprietary Natural Frequency Technology. The company has acquire notoriety no only through their commitment to superior product and use of natural frequencies, but also with a large celebrity following over the years including Oprah Winfrey saying it is “one of her favorite things” three times and regular customers like Rupert Murdoch, Madonna, Samuel Jackson and many others. PeaceLove Studios is a growing community of mental health advocates and artists creating conversations of acceptance, understanding, and hope. Through the dissemination of the PeaceLove symbol, the organization is dedicated to breaking the silence and eliminating the stigma surrounding mental illness, unifying the tens of millions of individuals and families affected by these diseases. Through the sale of PeaceLove Studios Merchandise and original artwork, a portion of all proceeds is allocated to support like-minded non-profit organizations that work to provide resources and opportunities for individuals coping with mental illness. In addition, through strategic partnerships and programming, such as their Paint4Peace™ arts initiative, PeaceLove Studios strives to provide individuals with free programs and experiences designed to help create peace of mind. To provide high quality luxury watches affordable for everybody, that´s what the new wristwatch collections by FELDO Luxury S.L. offer. Everybody who is searching for special ladie´s watches and men’s´ watches will be delighted by all the brand new FELDO Luxury S.L. watches. Not only the whole design and composing of the wristwatches is highly convincing. Moreover the detailed realization of high class design elements is remarkable. In all luxury watches the customer can find an original design and a special technical extra. Furthermore, the high functionality of these watches guarantees the possibility to read the time easily. This special technical aspect of each watch is protected by a patent by FELDO once a new design has been created. Nowhere else in the world watches with a design like this can be found. 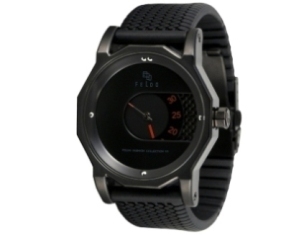 And this makes FELDO´s watches so special. All luxury watches designed and manufactured by FELDO Luxury S.L. are produced using both accurate machinery and the most experienced experts. The production of each part is performed by the best companies of the world in order to achieve the highest level in design and quality. Especially the remarkable watches are manually assembled by Swiss watchmakers and a German goldsmith. Like this, the uniqueness and unusualness are certifying its title as being exclusive pieces. The labels “Swiss made” and “Made in Germany” is familiar program at FELDO´s new collections. 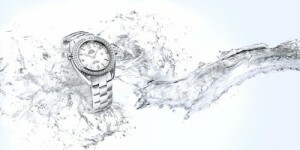 The finest watches series are most exclusive pieces of jewellery. These watches are featured with a Swiss handmade mechanical watch mechanism and combine the most modern materials. The finest watches series 1-1 and 1-2 are custom tailored for a perfect appearance. The material combination of carbon fiber, warm red gold or cool stainless steel and the patented time indication make these watches something special on the market. For the more sporty and juvenile wearer FELDO Luxury S.L. has designed the Fashion Line and Sportive Line. The Fashion Line definitely catches the eye. Unconventional and special design in combination with exceptional materials and the patented time indication complements and completes every outfit. The Sportive Line supports every imaginable active lifestyle. No matter if playing golf, going diving or driving a racing car, these chronographs are eligible for everything and look great on everybody. Patek Philippe and Rolex watches are among the 500 timepieces, pocket watches, and clocks on sale atAntiquorum’s “Important Modern and Vintage Timepieces,” to be held on May 15 in Geneva’s Mandarin Oriental. A Patek Philippe Reference 130 with pink dial (pictured above), confirmed by the extract from the archives will be among the watches on the block. This “Staybrite” stainless steel wristwatch with square button chronograph, register and tachometer scale was made in 1941 and was sold on March 3, 1943. Its presale estimate is $173,000 to $231,000. A second notable Patek is a Reference 5970G, circa 2006, 18k white gold wristwatch with a square-button chronograph, register, perpetual calendar, moon phases, 24 hour indication, and tachometer (presale estimate $115,000 to $173,000). Among the Rolexes being offered at auction is the Rolex “Oyster Perpetual Date, Explorer II,” Ref. 1655, Spade of Oman, was made in 1974 and retailed by Asprey of London. It is the first time this watch is available. It is one of the few Rolex watches to feature the “Spade of Oman” logo. These special watches, with case number engraved on the inside case back, were sold by Asprey, the official Rolex retailer in the Arab world. This model also bears the rare engraved “Asprey” name on the outside caseback (presale estimate $115,500 to $173,000). Another Rolex on the block is the “Oyster Perpetual, Comex, 660ft./200 m, Superlative Chronometer, Officially Certified,” Ref. 1665, Rail Dial. The 1980 watch is accompanied by its original guarantee, 1970s Submariner and Oyster booklets, hang tag, anchor and original fitted box, as well as a COMEX magazine and COMEX regulator (presale estimate $81,000 to $150,000). Among the fine pocket watches on sale is a Louis Audemars “Grande Complication – “La Russe II,” No. 12199, that retailed by G. Aspe, Paris in 1896. This timepiece is one of the most important complicated watches of the 19th century, Antiquorum says, with double perpetual calendar for Julian and Gregorian calendars, as well as minute-repeating, two time zones, chronograph, central 60-minute register, moon phases, lunar calendar and “reference d’heure” world-time calculation chart functions (presale estimate $115,000 to $173,000). The auction will celebrate the 80th Anniversary of the iconic Reverso watch with a selection of 30 Reversos, including original pieces from 1931, emblematic and ultra-rare versions with colored dials, limited series with complications, and watches with enamel-decorated case backs. Jaeger-LeCoultre is partnering this special “Reverso Chapter,” and will provide an extract from its archives, free of charge, for each lot made prior to 1950. The Reverso was created in 1931 for British army officers stationed in India who requested a watch that could survive a polo match. The swiveling case of the Art Deco-style watch protected the dial and offered a surface that, as of the 1930s, could be personalized by means of engraving or enamel. One of the highlights of the Reverso sale is a very rare and early Steel Reverso with red lacquered dial with a presale estimate of $5,775 to $9,200. One of the very first models to bear the LeCoultre signature, a 1930’s Staybrite watch with chocolate-colored dial is a classic Reverso watch with small seconds. Six others are featured in the sale, including a rare example made for the French market and bearing the Jaeger signature, and another watch from among the few that were destined exclusively for the American market (presale estimate, $5,778 to $9,200). Among the modern Reverso wristwatches, the highlight is the “Mucha’s Four Seasons” No. 1/25, Ref. 276.1.62, a set of four enameled pieces introduced in the 1990s and made in a limited edition of 25 sets. On the back of each case is a painted enamel portrait of a woman symbolizing each of the four seasons by Miklos Merczel, the manufacture’s enamel artist (presale estimate $70,000 to $92,000). Jason Arasheban, one of the rising stars of the watch industry in recent years, has launched a new collection, including an addition to his renowned ‘Hubris’ range. The Dunamis Hubris Sport, which offers a casual twist on the classic Hubris watch design, was unveiled at the recent BaselWorld watch and jewellery show in Switzerland. 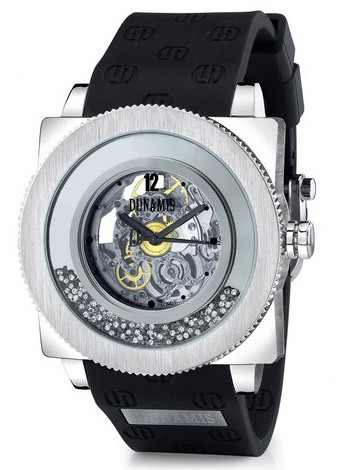 It features a signature “liquid diamond dial” containing carefully hand selected VS stones. The brushed finish of the stainless steel bezel and the redesigned monogram bands lend the timepiece a contemporary look. As well as his involvement in watch-making, Mr Arasheban has also featured on popular TV shows, including “Keeping Up With the Kardashians” and “Brandy and Ray J’s Family Business”. Watch brand Ziiiro has come up with two new watches use an analog mechanism to display time in a visually-striking way. This time around, we have the Aurora and the Orbit. Of the two, the Aurora looks most interesting since it mixes two colors to show the time. 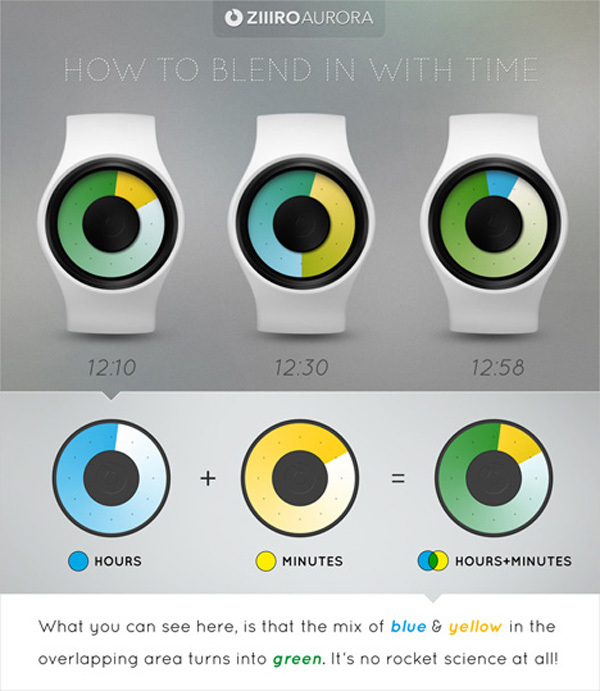 On the Aurora, the hour indicator uses a blue gradient, from 100% to 0% while the minute indicator uses a yellow gradient. The overlapping layers create a color mix that changes throughout the day. 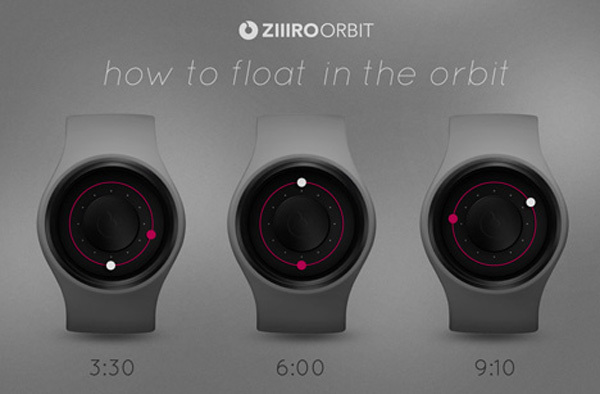 Ziiiro’s watch will allow you to intuitively learn a new way of telling time, just by looking at the resulting color mix. The Orbit was inspired by space and the solar system, simply using a red planet to indicate hours, and a white one to indicate minutes. 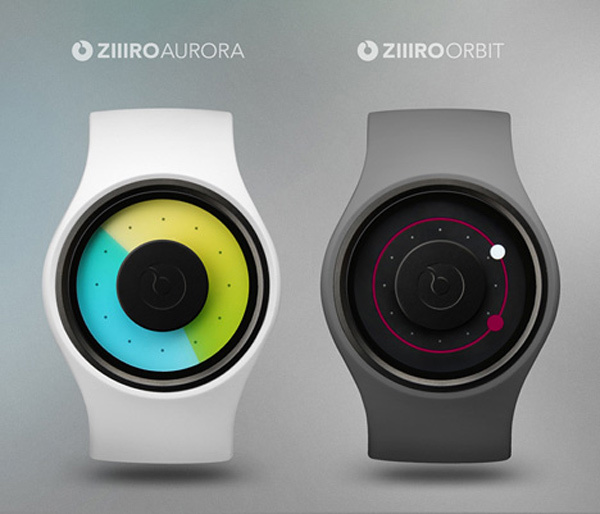 You can buy these watches online over at Ziiiro for €129 ($184 USD). I have never been a fan of the Celeb/Designer ala Kathy Lee, Sean Jean, or J. Lo, because it is basically a gimmick. No, it is actually a gimmick, and one that benefits people who are already over privileged and rewarded for not only contributing to, but glorifying the conspicuous consumption that is at the root of every problem in which the US has become mired. Which is also celebrated by the Oprah viewers and MTV crowd for whom People magazine counts as literacy. So fight fire with fire and set facetiousness (almost completely) aside. Leonardo DiCaprio seems to be one of the celebs who is actually willing to put his money where his mouth is, or at least his wrist. 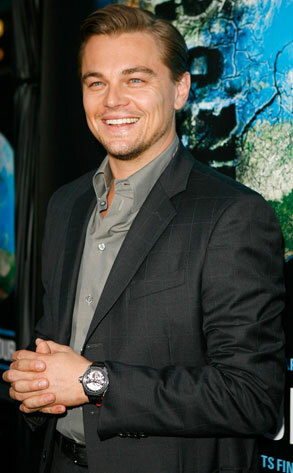 The auction of these watches is for the benefit of the Leonardo DiCaprio Fund at the California Community Foundation. All proceeds to directly benefit the cause of environmentalism. 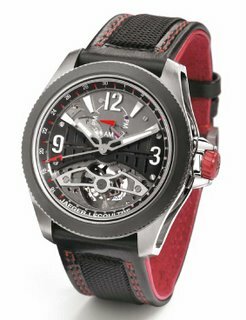 The first watch valued at $300,000.00, a one-of-a-kind Master Compressor Extreme Lab, which DiCaprio wore to the premier of the 11th Hour, a feature length documentary in the vein of “An Inconvenient Truth” about the impact of human industry and commercialism on the environment. Made with carbon fiber and titanium, this watch offers a pointer-type AM/PM indication at 12 o’clock, for those who have some trouble determining day from night for themselves, as well as the first mechanical movement to operate without any lubricant; thus, eliminating those pesky trips to Jiffy Lube when your watch is running a few quarts low. This piece has been engraved with DiCapro’s autograph. 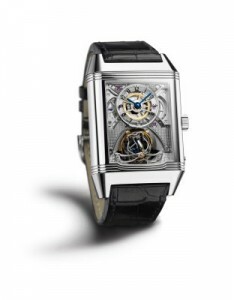 Jaeger-LeCoultre’s second offering, apparently named after his favorite helicopter, is the Reverso Gyrotourbillon 2. Designed for the 175th anniversary of the company, it is made out of platinum and valued at twice the value of a comfortable two bedroom home on a quarter acre, or approximately $400,000.00. Setting the bar ever higher for Timex and Citizen, this watch has the first-ever spherical tourbillon, and also boasts a 50-hour power reserve. I only wonder how long it runs before you hit that reserve, and is there a led that tells you, you have two days left on the battery, or do they call you from the factory after linking to your watch through wireless internet and GPS global location service? Is that a separate subscription fee? DiCaprio is an advocate for alternative energy, so be warned, it is just possible you will have to wind these watches yourself.